Today’s CITY GUIDE is brought to you by Laura! It only took a day for me to fall in love with Madrid. Against all odds, I didn’t miss the ocean or the beach but was intrigued by the small streets, huge buildings, and the art community. The capital of Spain has so much to offer and I am happy that Allie gave me the chance to share some of my favorite places with you. When I lived in Madrid I lived right on Calle Fuencarral. Next to Gran Vìa, Calle Fuencarral is the biggest shopping street, with an indoor mall, the Mercado Fuencarral, small boutiques and Spanish retailers such as Custo, Pull & Bear, Oisho, and Desigual as well as restaurants, bars, and pubs. Some of my favorite boutiques and bars are a few streets away from the main street in a small barrio called Malasaña. Malasañas heart is the Plaza del 2 de mayo. A little square that turns to a flea market on the weekend and that is just far enough from the main streets to let you enjoy a sunny day in Madrid in one of the little cafes located around the square. I usually get a caña at Café de Mahón, a bar that display art by locals, before strolling up Calle Veladere to visit my favorite vintage stores and little boutiques. La Mona Checa, La Cierva Vintage, and Moskitas Muertas. Also located in Malasaña are two of my favorite bars/clubs: The Via Lactea and the Tupperware. Both play amazing music, and while the Via Lactea is a place to listen to music, grab a beer, and play a round of pool, the Tupperware is a funky club to get your groove on. If you are looking for more main stream places, the Puerta del Sol is the perfect meeting place. 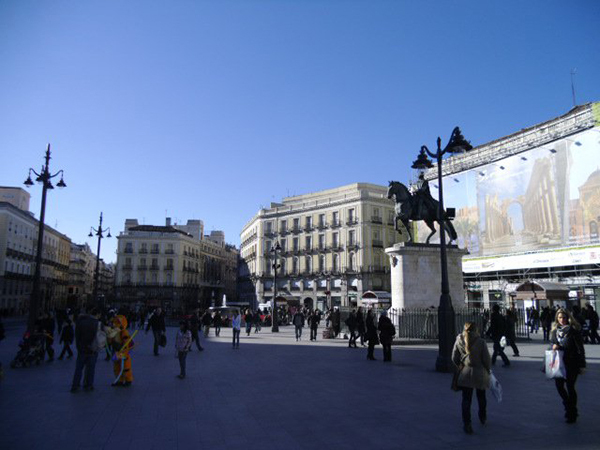 Not only is Sol the heart of Madrid and Spain, it is also the point where all the main streets from the city center meet, the place to start a great night out, and to catch a metro to almost anywhere in the city. If you are at Sol, watch out for ‘El Oso y el Madroño’, one of Madrid’s most known statues. If you take Calle Mayor from Sol, you will walk down a big street, hosting two places that captivate the spirit of Spanish food the Museo del Jamón and the Chocolatería San Ginés. 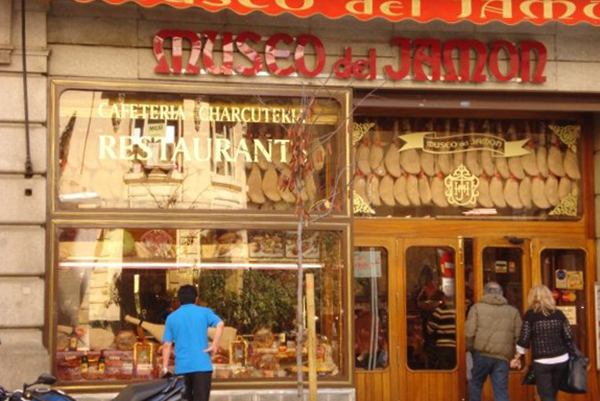 Museo Del Jamón, is a typical Spanish bar and restaurant that serves all kinds of Spanish food, with emphasis on ham iberico. Everybody loves the churros con chocolate at the Chocolatería San Ginés. After you get out of a club or bar, you can stop here to get a snack before taking the metro home- If you walk a little further, you will end up at the Royal Palace, the Palacio Real. 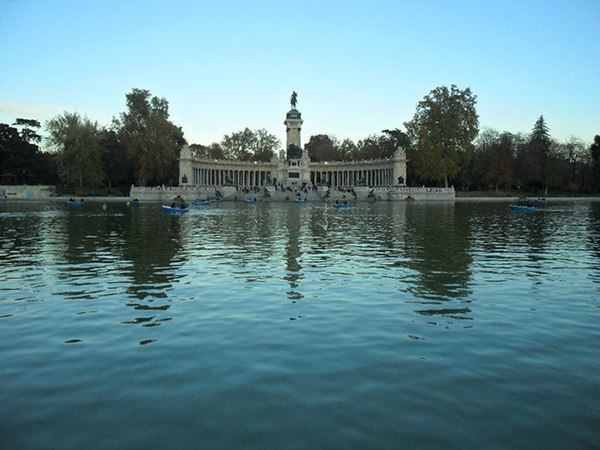 The Retiro is the Central Park of Madrid, a huge park with a lake in the middle. It is the perfect place to go and relax, no matter what time of year it is. There are always musicians, dancers, and other artist to entertain the crowds. Make sure to check out the Palacio de Cristal, a building entirely made out of glass, that is used as an exhibition space for El Prado museum. No matter if you feel like taking a walk, renting a paddleboat, or just laying in the afternoon sun, the Retiro is the perfect place to go. Especially, after a Sunday at the local flea market: El Rastro. 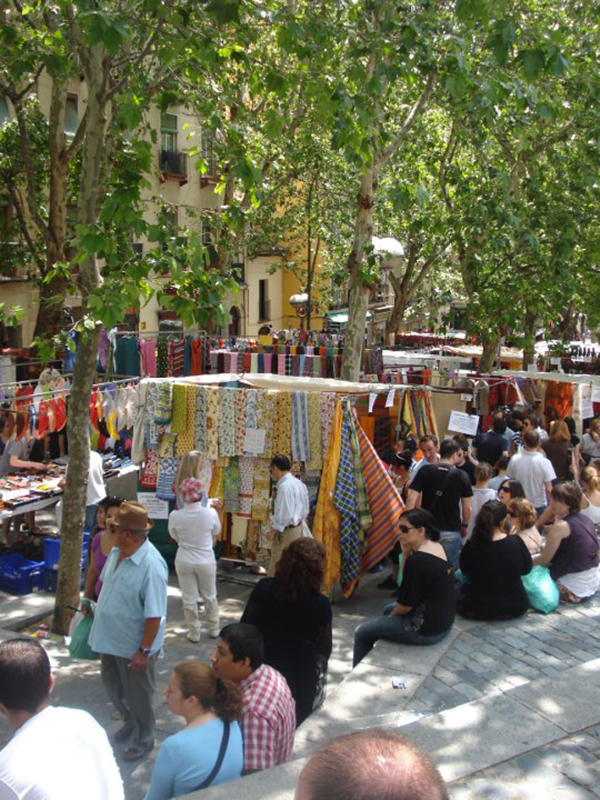 Located in the more bohemian parts of Madrid, Lavapiés and La Latina, the flea market offers a lot of great Spanish flavor. Go early to shop for antiques, or a little later to enjoy bargaining with the vendors and have lunch at one of the many Moroccan restaurants around. Thanks Allie! It was so much fun to write this post and I’m excited to share all my memories with you and the readers! 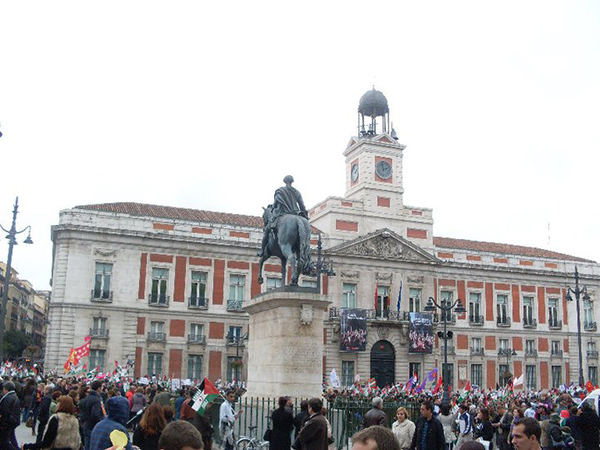 Oh goodness, I am certainly convinced I need to visit Madrid! It sounds simply wonderful! Lovely post, great job, Laura! Glad you enjoyed Laura’s guide! !